Former Red Knight winding down collegiate career. It happens more times that you may think. A coach on a recruiting trip walks into a rink with his mind fixated on a certain player, a-can’t-miss kid. But then something happens and everything suddenly changes. Spencer Naas and Johnny Austin played together since they were freshmen in high school, Naas the high-scoring forward, Austin the steady defenseman. They even transferred to Benilde St. Margaret High in St. Louis Park, Minn., together their after their sophomore seasons. And that’s where UConn coach Mike Cavanaugh was when he experienced one of the most pleasant surprises he’s had in his five years as the Huskies’ coach. Spencer Naas has 49 career goals for the Huskies. Spencer Naas leads UConn with 12 goals this season and is second with 23 points. Periera’s opinion concurred with that of his boss. What Cavanaugh said was typical of Naas; fast on his blades, instinctual as a scorer. And it wasn’t long after when the phones began to ring. “I remember the game and I don’t think I played particularly well, at least for my standards in high school, but I must have done something for Coach Cavanaugh to notice,” Naas said. “I don’t actually believe I spoke to [Cavanaugh] personally after it was over. But soon after, Joe Periera contacted Johnny and I on the phone and I remember one day after practice I said to Johnny that I got a call from the University of Connecticut. He said, ‘I got one, too.’ The coaches told neither of us that they had reached out the other. After convincing Naas that he should start his college career immediately, as opposed to playing junior hockey for a year, Naas and Austin made a decision that now resonates throughout the program. No one knows when it will all end, when the nine seniors who came UConn to help build its Hockey East program will play their final game. But one thing is for certain: The Huskies hope the beginning of the end isn’t Game 1 of their best-of-three quarterfinal series with Boston University that begins March 9 in Boston. This program, which won seven of its last eight games to secure a fifth seed and first-round bye, is confident now in its ability to win anywhere at any time. And it is anxious to show it against a team it just defeated 5-4 in overtime at the XL Center on Feb. 16. 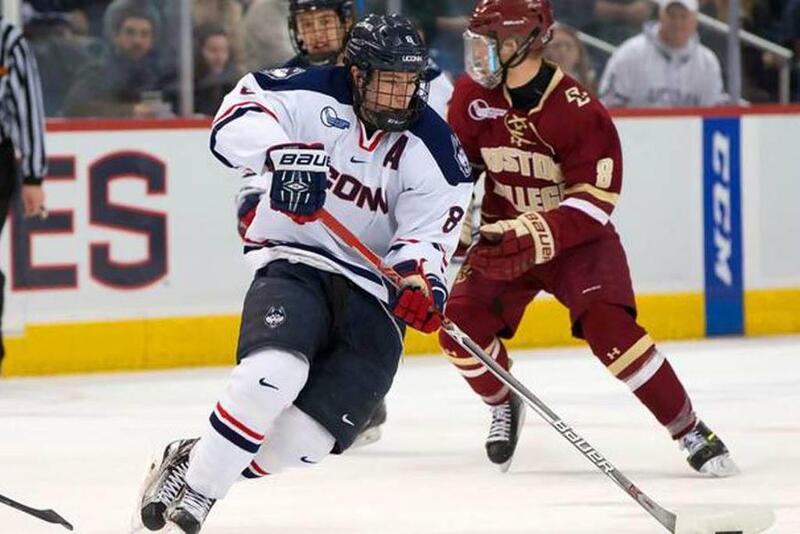 No UConn player is currently playing better than Naas, who began his career by playing in all 36 games as a freshman and leading the team with 13 goals. Here is what he’s done lately: Naas is second on the team in scoring with 12 goals and 11 assists, the points and assists career highs. Those points swelled his career numbers to 49 goals and 27 assists. The 49 goals are tied for third in UConn’s Division I history. But he is on a career-best eight-game point streak and with a goal in each of his last three games. During that stretch, the Huskies are 7-1-0 and Naas has 12 points (six goals). The Huskies are 7-3-0 this season when he scores a goal.